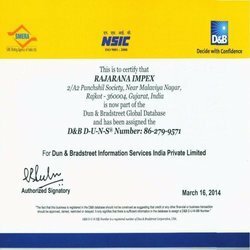 Established in the year 2006, Rajarana Impex is one of the leading exporters, importers and suppliers of diverse range of products. We provide our clients with Construction Machinery, Auto Parts, Hardware Parts, Diesel Engines and Pumps. In addition, we also procure Agricultural Products, Grinding & Hammer Mills and Crushers. Besides, we are also known as the leading supplier of Arch Welding machine and Plastic Ropes. These products are manufactured at the vendor’s premises as per the quality standards of the industry. Our tie-ups with the leading vendors have helped us in serving optimum quality products to our clients worldwide. With our client centric approach, we are capable of understanding the specific requirements of our clients. We carry stringent quality test right from the sourcing procedure until the final dispatch. Meeting the requirements of various industries, we have become a leading exporter and importer. We led by our founder and CEO Mr. G.K. Jhala, who is a well qualified commerce graduate and has a vast industry experience of 30 years. Moreover, he has also worked with two renowned Export Houses as an Export Executive for 20 years. Under his visionary approach and guidance, we have garnered a vast clientele in Africa, Middle-East, South-East Asia, Europe and America. Trading of Industrial Machines, Equipment AND Tools. These products are well tested on well defined parameters to ensure international quality standards. Machinery: Workshop Machinery, Lathe, Power Press, Bending, Cutting, Welding Machines & specialized tailor made machinery as per customer requirement. Milling & Grinding machines: Flour Mills, Hammer Mills, Pulverizers, Rice Hullers, Threshers, De-stoners etc. We export and supply a wide range of machines, components, tools, hardware and other products. These are highly appreciated by our clients both in Domestic and International market. We are able to meet the variegated requirements of our clients due to the assistance of our team of skilled and hardworking professionals. The innovative approach, dedication and passion have enabled us to multiply the growth of our organization. These professionals work in close union with each other which helps in improving the quality of our services. Moreover, our workforce is monitored by our CEO who encourages the employees for outstanding performance. Though we are a young organization, we have become of the foremost choices of our clients.